Climate Change Connection > Science > Are humans the cause? 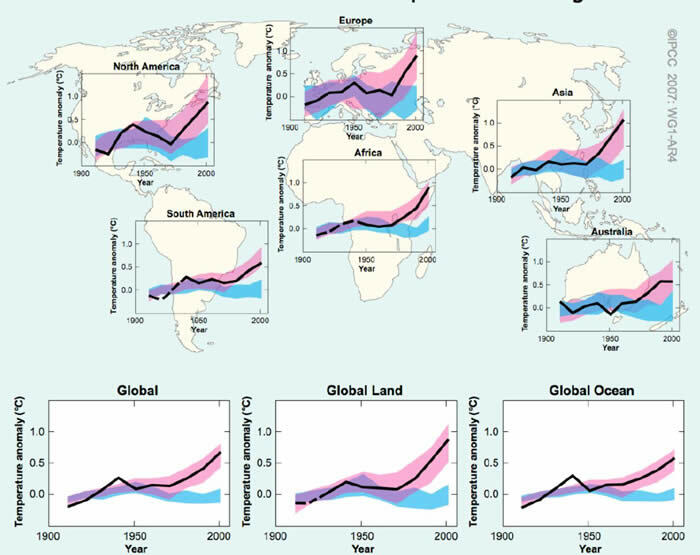 Q1: How do scientists know human activities are causing the recent warming? Prior to the Industrial Revolution and subsequent exploding world population, the Earth’s climate changed in response to natural forcings. These changes to the climate generally evolved over long periods of time, shifting from ice age to interglacial period and back again. Blue shaded bands show the 5–95% range for 19 computer simulations from 5 climate models using only the natural forcings due to solar activity and volcanoes. Red shaded bands show the 5–95% range for 58 simulations from 14 climate models using both natural and human forcings. Carbon dioxide (and other greenhouse gases) is added to the atmosphere by natural processes and by human activities. In the past, carbon dioxide levels have been able to remain fairly constant as the release was in balance with the uptake. Today, humans are releasing carbon dioxide into the atmosphere at an accelerated rate. This increased contribution is occurring too quickly for the environment (the oceans, vegetation) to respond and absorb the excess. As a result, carbon dioxide concentrations in the atmosphere are increasing. The main sources of the excess carbon dioxide can be traced back to humans. Since the Industrial Revolution, we have relied on fossil fuels to power our lives. We use fossil fuels to get around, to heat our homes, and to drive our industries. As our dependence on fossil fuels grows, so do our carbon dioxide emissions. Humans are not only releasing excess carbon dioxide to the atmosphere, but are changing the planet’s ability to deal with this excess. As the world’s population grows, we take over greater portions of our planet’s surface. We clear land to make way for cities and human settlement. We manipulate our landscape in order to grow more food, and allow more livestock to graze. By altering the natural landscape, we are altering the environment’s ability to deal with the excesses that we have created. Q2: Humans contribute a very small amount of carbon to the atmosphere compared to natural processes. How can it have such a huge impact? Our planet has a natural cycle that moves huge amounts of carbon — 200 billion tonnes — into and out of the atmosphere every year. When the cycle is balanced, atmospheric carbon dioxide (CO2) levels remain relatively stable. Careful measurements over the past few decades have confirmed that CO2 in the atmosphere is increasing. Human activities are adding about 7 billion tonnes of carbon into the armosphere every year, which is only about 3–4% of the amount exchanged annually. This small addition is enough to upset the balance, surpassing nature’s ability to absorb carbon. The oceans and land are currently absorbing half our emissions, but the rest remains in the atmosphere for at least another 100 years.